Recently, a list of the richest banks in the world was compiled by a trade magazine. The Banker, which released its annual list of the top 1,000 global banks, revealed that many of the biggest names in the UK industry weren’t as high up the table as they would have been a few years ago. As proof that the crash had adversely affected their performance, only one actually improved its position. Top of the pile was a surprise new entry, the Industrial and Commercial Bank of China (ICBC). It was third a year ago, swapping places with previous table-topper Bank of America. 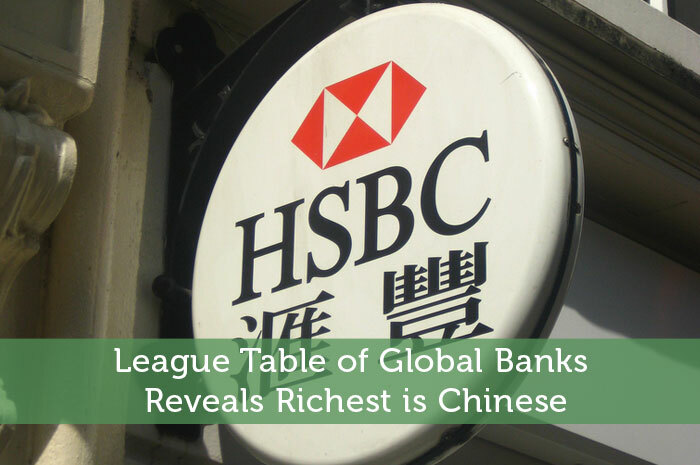 In second place was investment bank J P Morgan, while HSBC, helped largely by its Asian operations, came fourth. HSBC were the only British bank in the top 10 of the list. Overall, many British banks on the list fared poorly. Although Standard Chartered was a notable exception, moving up to 33rd on the back of a 3% increase in profits, many of their rivals did far worse. Both HSBC and Barclays, seen as global banking giants, reported falls in profits which harmed their respective rankings, while Lloyds found themselves in the red. “Lloyds was the biggest faller shedding over 6.5% after reporting a loss for 2012 and set aside extra provisions to cover potential claims from PPI mis-selling. The bank reported a net loss of £1.43 billion, narrower than the loss of £2.79 billion in 2011; however the bottom line was hit by £1.5 billion in charges just in Q4 to cover potential payouts, taking the yearly figure to £3.575 billion for mis-selling PPI.” explained a spokesperson from CityIndex. While the collective profits of banks in the UK fell by 31% in the past year, that pales into comparison with Spanish banks, whose combined losses of $73bn equated to nearly 5% of the country’s gross domestic product (GDP). Six of the top 10 loss-making banks were based in Spain, which shows that the sector in that particular nation is in some trouble. Back in 2007, the UK banking sector as a whole accounted for 11% of global banking profits, although that dipped to a far more modest 2.61%, putting them behind their rivals in the US, France and Germany, as well as in parts of the Far East. As a reflection of the UK’s gradually diminishing global banking importance, the Co-Operative Bank was the 25th biggest loss-maker last year. While many banks’ shareholders will have reason to feel anxious, what about the impact on customers with saving accounts who wonder if their money will still be safe? If their bank suffers heavy losses, then they may feel that their hard-earned money might be at risk of being lost in order to pay for the mistakes of others. As the list shows, profit is by far the biggest goal which many banks have, often forgetting that they have to think about providing for their customers as well. What the list didn’t account for is some of the larger building societies which many go to for their saving/borrowing needs. Banks are more likely to put the needs of their shareholders first, especially in the pursuit of profits. This can prove to be damaging, especially for banks struggling to gain new customers. I personally think most banks are on a downward slide. But as usual a lot of movement will take place but they are still making money just not as much as they use to. I can agree with you on that Tom, the banks may be on a downward slide, but they are still making a killing and given some of the bonuses one hears in the banking sector, they really don’t seem to be doing so bad!